Oil palm originates in West Africa. Since it looks like coconut, it is also called �oil coconut�. The oil content in its fruits can reach as high as 50%. Each oil palm can produce as many as 30-40 kilograms of oil, and each mou (1/15 hectare) of oil palm can produce as many as 100-200 kilograms of oil. If the oil palm is of an eminent variety, the oil output of one mou can be as high as 600 kilograms. The oil production of oil palm per mou is 2 - 3 times that of coconuts, and 7 - 8 times that of peanuts; therefore, it is praised as the �king of oil in the world�. Since oil palm has very good yield and can be applied widely, it is widely transplanted in tropical and sub-tropical areas in the recent 100 year. Hainan, Guangdong, Guangxi and Yunnan of China started to plant oil palms from 1926. The oil of oil palm is called palm oil. It contains a large amount of carotene, vitamin E and microcholesterin etc. Its burning point is low; the potato chips and convenient food fried with it are not only crisp but also quite tasty. Besides, it can be stored for quite long time; therefore, people in tropical areas deem it as a kind of high-rank eligible oil from many years ago. Distilled palm oil is as clear as water and as smooth as grease. It not only can be used for medical purposes, it is also a high-rank lubricant in machinery manufacturing and aviation industry. Palm oil is a very good anti-rust and welding agent. Besides, palm oil can also be used to produce soaps and fancy soaps. The kernel of oil palm can be used to produce sauce, and its shells can be used to produce activated carbon. The old palm fruits are quite interesting. They always hide in the thorny legumen; they look elliptical and their surfaces are quite smooth. They are green or dark brown when they first grow out with the size as big as horsebeans; and they turn into yellow or red when they are ripe with the size bigger than the eggs of pigeon. Ripe oil palm fruits can be cooked into food by adding a bit salt or sugar. The pulp of the fruits is fat but not greasy, but there are some coarse fibers in the pulp, which may cause a problem to the teeth. If we say that betelnut is a shy girl in the palm family, then oil palm must be a handsome and tall young man. 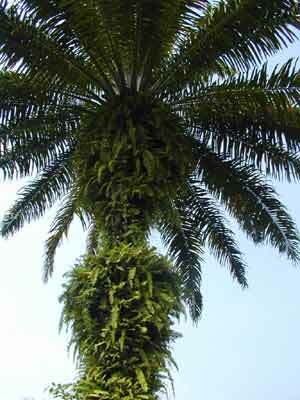 It grows tall and mighty with luxuriant branches and leaves, and the canopy is like a giant umbrella. Its thin and long leaves spread towards around or bend down naturally. They are smooth and green, and are quite catching to the eyes. In Xishuangbanna Tropical Botanical Garden, there is a piece of land where oil palm trees have been planted for many years. It has become a sight of the botanical garden, attracting many Chinese and foreign visitors. Pretty Dai girls in the surrounding villages often come here in twos and threes with colorful paper umbrellas. Besides, many film directors also use the oil palm woods as an ideal place for shooting scenes of the tropical area, such as the early famous film named �Peacock Princess�, and recent films such as �Go to the Green Forests in the Wild�, �For the Sake of This Pure Land�, and �Pursuing the Sun� etc.